Get more information about refractive surgeries and the possibilities about seeing without glasses. For questions or directions please feel free to contact us! 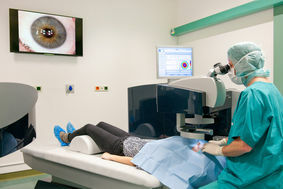 Thanks to latest techniques, such as the femtosecondlaser, the safety and accuracy of catarct surgeries or refractive lens exchanges can be improved. The centering of special lenses is optimized and corneal tissue is protected. By the use of a new refractive laser suite, consisting of a femtosecond and an excimer laser, the flap preparation which is needed for a Femto-LASIK is reduced to six seconds, the laser treatment time up to 1.4 seconds per diopter. This allows a faster treatment and makes the surgery more comfortable.